An easy, year-round approach to Crater Lake. From Eugene, drive the Interstate 5 (I-5) corridor to Roseburg, and then head east along the North Umpqua River (OR-138 E to OR-230 to OR-62 ). This trip is approximately 173 miles (278.42 km). Go south on I-5 through Eugene - Springfield. You can remain on I-5, or take scenic Hwy 99 paralleling the interstate to see old homesteads and rural farms.. From Hwy 99, go west on Dillard Rd to visit an Alpaca farm. To divert onto Hwy 99, take exit 188 toward Hwy 58, stay right and merge onto Hwy 99. You can return to I-5 in Cottage Grove. Within 3 miles (4.83 km), both Hwy 99 and I-5 reach the quiet town of Creswell. 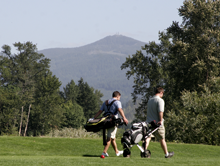 Here, nestled against forest and mountain foothills is the Emerald Valley Golf & Resort. This public par-73, 6,200-yard (5,669 m) course is a home golf course for the University of Oregon golf team. Enjoy the rural solitude as you swing your club on this championship course. Another reason to stop and stay in Creswell is Chef Heidi Tunnell&apos;s Creswell Bakery. This culinary triumph serves up cafe fare and baked goods utilizing ingredients so local that many are direct from the Heidi&apos;s own nearby family farm. Creswell&apos;s Garden Lake Park on Melton Rd, west of I-5, offers 33-acres (.13 km) of forest and wetlands surrounding a small lake. Picnic facilities, restrooms, interpretative center, trails and boat dock make this an ideal rest stop. Enjoy bird watching, canoeing and hiking. Creswell has comfortable lodging and RV options, along with a small museum and a few stores. Off I-5 there is an Oregon State Department of Transportation Rest Area at Gettings Creek - Eastbound, between Creswell and Cottage Grove. This is the land of Pinot, and Saginaw Vineyard is a nice sampling of Oregon&apos;s boutique wineries. Based out of a 1905 farmstead, ten acres of grapes are hand-crafted into a small production of just 2000 cases of wine each year. 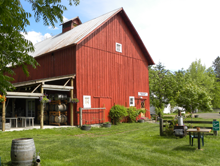 Family-owned and operated, Saginaw Vineyard also produces award-winning blueberry and blackberry fruit wines under the label Delight Valley Farms. From 1-5 take exit 176, right on E Saginaw Rd and right on N Delight Valley School Rd. From Hwy 99, turn left on E Saginaw Rd and left on N Delight Valley School Rd. Cottage Grove is a gateway to Oregon Wine Country. Set some time aside to visit the many wineries in the vicinity. Explore the Wineries & Covered Bridges Tour along Territorial Hwy to acclaimed wineries like King Estate, Sweet Cheeks and Silvan Ridge. The All America City of Cottage Grove has a rich gold rush history and maintains its historic charm.Just 9.2 miles (14.81 km) south of Creswell, Hwy 99 goes right through the heart of Cottage Grove, or take Exit 174 off I-5. There are many attractions here but the community&apos;s prize jewels are six beautifully preserved covered bridges. This is the greatest concentration of bridges west of the Mississippi! 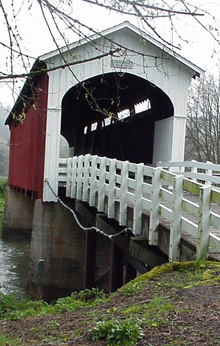 Drive or cycle the covered bridge tour through town and around Dorena Reservoir following the Row River Trail. It&apos;s a tradition. The lines are long, but you can call ahead to place your order (541.849.2570). The K&R Drive-inn, a local family-owned restaurant, opened in the 1970s serving huge Umpqua Dairy ice cream cones. What was once just a truck stop, is now an I-5 must stop! Twenty-five miles (40.23 km) from Cottage Grove, take Exit 148 (Rice Hill), and follow signs for the K & R Drive Inn. Next are the small communities of Oakland (Exit 140) and Sutherlin (Exit 136). Oakland was the first Oregon city to establish a Historic District (1968). Sutherlin&apos;s visitor information center, in a little log cabin, provides information on Umpqua Valley wineries; fishing; and hunting for deer, elk and turkeys. Sutherlin also offers dining, a dog park and playground. Twenty five miles (40.23 km) from Rice Hill is Roseburg with fun attractions such as Wildlife Safari and the Douglas County Speedway (May - September). To visit the River Front Park, exit 138, turn right on NW Garden Valley Blvd, and left onto Centennial Dr.
To continue on to Crater Lake, exit 138, turn left on NW Garden Valley Blvd, right on NE Stephens St, left onto NE Stephens St and left onto Hwy 138 E/NE Diamond Lake Blvd. At this junction there are approximately 98 miles (157.72 km) remaining on the journey. Now you are traveling Hwy 138, the "Highway of Waterfalls," which is part of the Rogue-Umpqua Scenic Byway. This picturesque corridor is known for 33-miles (53.11) of year-round fly-fishing for rainbow and steelhead trout. Punctuated by many waterfalls, the winding road is a pleasure to drive. Stop in Glide, sixteen miles from Roseburg, to visit the North Umpqua Ranger Station. In Glide, don&apos;t miss viewing the "Colliding Rivers," a frothy convergence of the North Umpqua River and Little River meeting head-on. Twenty-two miles (35.41 km) from Glide, Steamboat Inn offers creekside cabins and woodsy cottages. Complete with fine dining and a fly shop, this quiet retreat is open spring through fall and most winter weekends except January and February. Diamond Lake, between Mt Bailey and Mt Thielson, is 40 miles (64.37 km) from Steamboat. One of the largest U.S. Forest Service campground in the Pacific Northwest, Diamond Lake offers a resort with marina, horse stables and a paved bike path encircling the lake. During the winter the bike path serves as a groomed cross-country ski trail, ice skating on the lake replaces boating, and snowmobiles cruise along the horse trails. From Diamond Lake it is approximately 21.59 miles (34.75 km) to Crater Lake. Summer/north entrance: Continue south on Hwy 138 toward NF-961. Take a slight right onto Crater Lake Rd. This road may be closed seasonally. Enter the park here and drive Crater Lake Entrance Rd until it becomes Rim Dr, staying to the right and onto Munson Valley Rd to reach Crater Lake Lodge. Check road status and weather reports. An alternative route is to approach Crater Lake from the south entrance. Year-round/south entrance: From Hwy 138 turn right onto Hwy 230. Follow Hwy 230 for approximately 23 miles, then turn left on to OR-62. Follow OR-62 for approximately 15 miles and turn left onto S Entrance Rd/Munson valley Rd. Enter the gate here and follow Munson Valley Rd to Rim Dr.
Loop back to Eugene - Springfield on US-97 N to OR-58 W toward Oakridge.